These two brushes have a small amount of use on them and are in excellent, almost new, condition. The Thater was once my favorite brush, but I have found that I prefer denser brushes with stronger backbone. This Thater 4125-1 (black) is the 24mm size two band in fan. It is super soft with white tips. I think an old time wet shaver would view it as the prototypical silvertip experience. Just a little too soft with a bit too much splay for my current taste. My Paladin, Shavemac, Chubby, Elite Manchurian, and M&F brushes have spoiled me. This is a great brush that is about a year old with not a lot of use. Retails for around $155. I'm asking $100 $90 $80. That is shipped to the CONUS. The Simpson is a Commodore x3 in Best Badger. Nice comfortable handle, with a 24mm knot. The hair is really nice. I like to hold my fingers around the base of the hairs when I use this one as it also splays a little too easily for me. These go for $75-$80, I'd like to get $60 NOW $50 $40. Again that is shipped to the CONUS. If you buy one or both brushes let me know if you want the 24mm Maggard synthetic on the right. It will be included for no additional money. I've tried to get on the synth. brush bandwagon, but I just don't love them. $140 $120 TAKES ALL THREE. Price Drop on the Simpson. Added lot price. Price drop to free up some space and help towards something new. 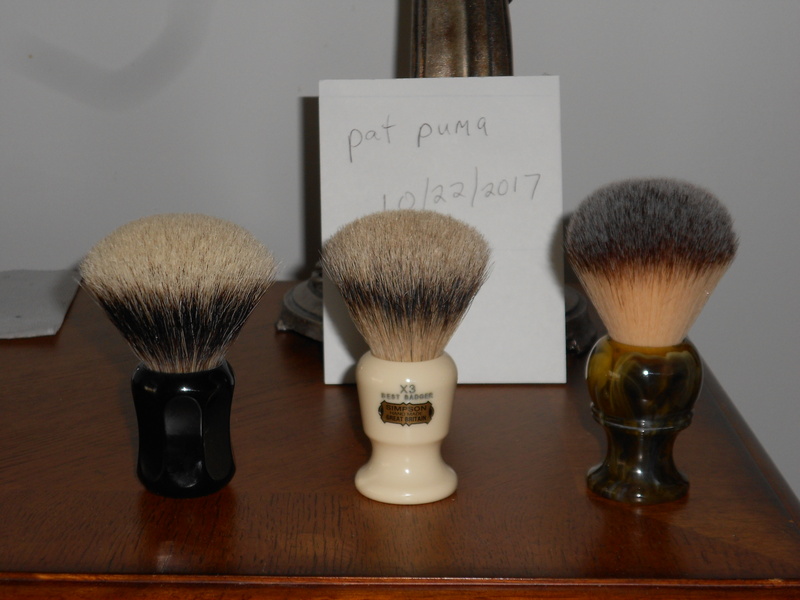 Thater=$90, Commodore=$40, first person who buys a brush gets the Maggard if they want it. $120 takes all three. Commodore and Maggard sold. Thater still available. One more price drop on the Thater 4125-1. $80 If I can't get that, I'll keep it and use it. Time for a bump. I just saw that a Thater 4125 sold fast on another BST and the asking price was $95. Same size, same 2 band hair, same color. The only difference is that one was a bulb. Mine is still available for $80 shipped CONUS. All sold. Thanks buyers, lookers, and TSN. Administrators Please Archive.